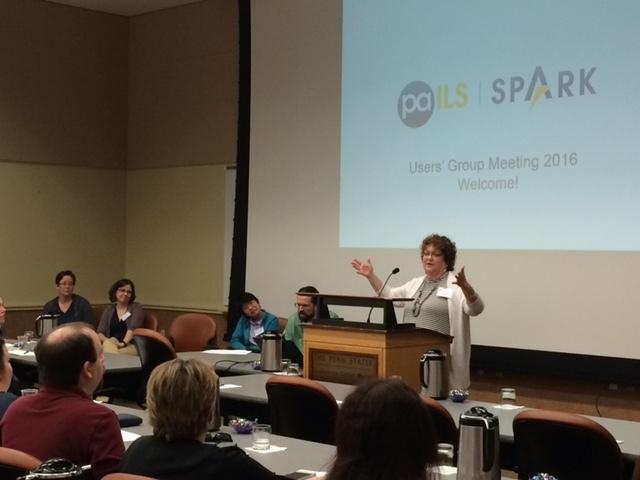 The big news is 71 people attended the annual SPARK Users Group Meeting in State College last Thursday. This is a record! Attendees got to travel in the SPARK Time Machine to hear about the recent past and the future, receive an introduction to Evergreen 2.10, hear reports on the Evergreen International Conference, and learn about tips and tricks for Cataloging, Circulation, the SPARK Catalog, and Reports. Let’s not forget the opportunity to compare notes with colleagues in other SPARK libraries. Can we break 100 next year? Mina Edmondson from the York County Library System talks to attendees about open source.